For the Oklahoma State Park, see Keystone State Park (Oklahoma). 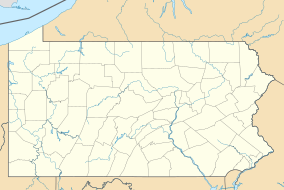 Keystone State Park is a 1,200-acre (486 ha) Pennsylvania state park in Derry Township, Westmoreland County, Pennsylvania in the United States. The main attraction of the park, which opened in 1945, is the 78-acre (32 ha) Keystone Lake, constructed by the Keystone Coal and Coke Company in the early 1900s. The park also has extensive picnic areas and several miles of hiking trails. Keystone State Park was named after the Keystone Coal and Coke Company that once occupied the area. The park is off U.S. Route 22 near New Alexandria. Keystone State Park is open to camping and also has several cabins that are available to rent year round. Keystone State Park has two campgrounds. Lakeside campground is on the shores of Keystone Lake. It has 40 campsites for tents or campers. Hillside campground is in a more remote part of the park. It has 60 campsites, also for tents or campers. Each campground has some sites with an electric hook-up, a modern bathhouse and a sanitary dump station. The cabins at Keystone State Park are modern. The 11 cabins are located near the dam and between the campgrounds. Each cabin can sleep up to six guests in two bedrooms. The cabins are equipped with a modern bathroom, a kitchen with a stove, microwave and refrigerator. The yard areas have picnic tables, grills and fire rings. Hunting is permitted on about half of Keystone State Park. The most common game species are eastern cottontail rabbits, common pheasant, eastern gray squirrels, wild turkey, ruffed grouse and white-tailed deer. The hunting of groundhogs is prohibited. Hunters are expected to follow the rules and regulations of the Pennsylvania Game Commission. Keystone State Park on a cloudy fall day. Keystone Lake is a 78-acre (32 ha) man-made lake built in the early 1900s. It provides a habitat for both warm and cold water species of fish. The common game fish in Keystone Lake are carp, northern pike, tiger muskellunge, largemouth bass, black crappie, yellow perch and bullhead catfish. The Pennsylvania Fish and Boat Commission stocks the lake with trout prior to the start of trout season in April. The lake is also open to ice fishing when the conditions permit. Gas powered boats are prohibited on Keystone Lake. Non-powered and electric powered boats must display a current registration from any state or a launch permit from the Pennsylvania Fish and Boat Commission. A beach on the lake is open for swimming daily from 8:00am until sunset. The swimming season begins on Memorial Day weekend and ends Labor Day weekend. Lifeguards are not provided. Dear Zachary: A Letter to a Son About His Father is a documentary film about Andrew and Zachary Bagby. Andrew was murdered at the park by Zachary's mother, Shirley Turner, who later murdered Zachary in a murder-suicide in Newfoundland. ^ "Keystone State Park". Geographic Names Information System. United States Geological Survey. August 2, 1979. Retrieved 2008-03-25. ^ Hopey, Dan. "Cutbacks put some state parks on shaky ground". Pittsburgh Post-Gazette. Retrieved 2009-05-24. ^ a b c d e f g "Keystone State Park". Pennsylvania Department of Conservation and Natural Resources. Retrieved 2007-01-15. ^ Gazarik, Richard (2003-08-20). "Turner, infant son found dead". Pittsburgh Tribune-Review. Archived from the original on 2010-04-07. Retrieved 2011-01-10. ^ "Find a Park by Region (interactive map)". Pennsylvania Department of Conservation and Natural Resources. Retrieved November 18, 2011. ^ Michels, Chris (1997). "Latitude/Longitude Distance Calculation". Northern Arizona University. Retrieved 2008-04-23. Wikimedia Commons has media related to Keystone State Park (Pennsylvania).